Since 1923, vacationing guests have sought the tranquil pleasures of the historic Ojai Valley Inn & Spa: a AAA Five Diamond property located on 220-tree shaded acres just an hour and a half north of Los Angeles and half-hour south of Santa Barbara. Affirmed by its many prestigious awards, the legendary inn is one of the nation’s unique hidden treasures. For reservations, please call 866.558.8088 or visit us online. Our venue can accommodate up to 400 guests. Plated dinners run between $90-$104, while buffet range from $85-$100. $1,500-$4,000, depending on the location. Yes. Our catering team will customize your reception menu, serving you and your guests only the best. We close at 10:00 p.m.
We do have our preferred audio visual company PSAV. Yes: guest rooms, suites and penthouses to name a few. The Inn also offers romance and anniversary packages for couples. From "The Bachelorette Experience," to the Bed and Breakfast package, we can help you unwind and relax after saying "I do." "Every girl dreams of having the perfect wedding, and I am lucky enough to say that my dream came true [at Ojai.] My husband and I knew the second we stepped on property at the Ojai Valley Inn that this was the place we wanted to start the rest of our lives together. 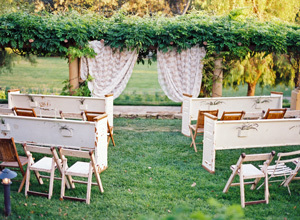 The entire process of getting married was amazing ... Ojai makes planning for your big day stress free! From the gorgeous grounds, to the phenomenal spa, to the mouthwatering food, Ojai truly is a heaven on earth." - Shannon D.